In this blog, I will describe the most common optical phenomena photographed in New Zealand. Most of the photos in this blog were taken in New Zealand, and sent in to us by members of the public. Of course, there is a massive range of atmospheric optics, and not all are listed here – so feel free to continue sending us your photos. We may have to add to the blog if we are sent photos of some that are not yet listed here! For most people, the most easily recognisable atmospheric optical phenomenon is the rainbow. Rainbows are seen when the sun is behind you, and there are raindrops in front of you. The droplets reflect the light back towards you. 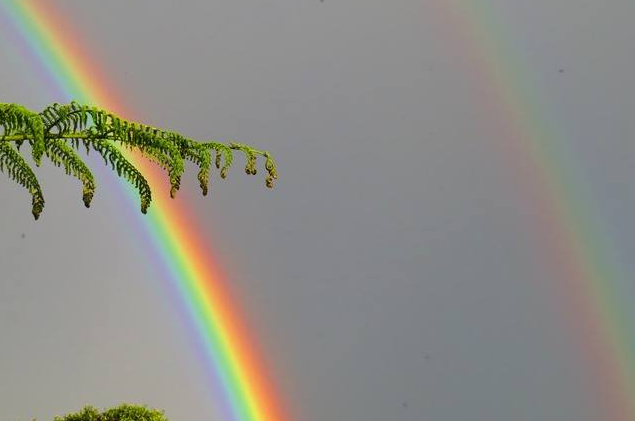 The photo below shows a double rainbow, photographed by Jacquie Flynn in Taranaki in October 2016. The outer rainbow is created by light being reflected twice within the raindrop. Crepuscular rays (sometimes called Sun rays, God rays or Jacob’s Ladder) are rays of sunlight that are seen when the sun is partially obscured by cloud. The rays are caused by sunlight streaming through gaps in the clouds, and are separated by darker regions caused by the shadows of the clouds. They are seen most frequently at sunrise and sunset, which is where they got their name (crepuscular: relating to twilight). While the rays appear to diverge, or fan out, they are in fact parallel. It is your perspective that causes this illusion – just like how a long straight road seems to disappear in the distance, even though the sides of the road are parallel. We see these all the time up on our hill here at MetService, looking down across the Wellington Harbour. This photo was taken by MetService Meteorologist Tom Adams from the roof of our building, in May 2016. Anti-crepuscular rays are similar to crepuscular rays, except you must be facing away from the sun to see them. Like crepuscular rays, they are usually seen at sunrise and sunset, and the rays are formed by the sun shining between clouds. The rays appear to converge towards the “anti-solar point”, which is a point directly opposite the sun from the view of the observer. 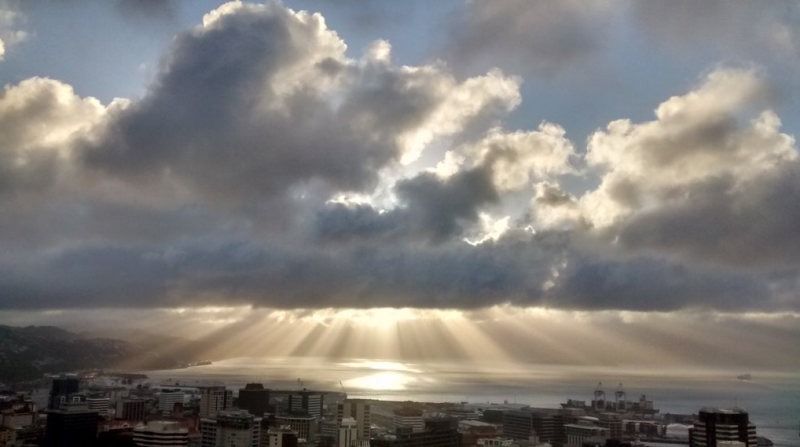 However, as with crepuscular rays, they are in fact parallel. The photo above shows a fantastic example of anti-crepuscular rays, along with some nice sunset colours. It was sent in by Tessa Blake (@tessabrianneblake on Instagram), taken in Dunedin in June 2016. 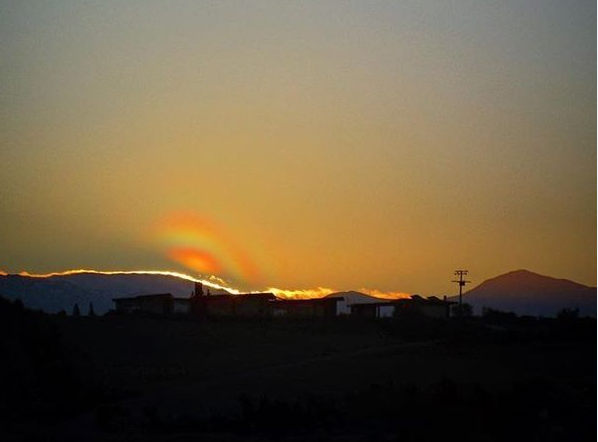 Cloud irisation (also called iridescence) is caused by sunlight diffracting around cloud droplets Diffraction is the bending of light as it passes between small gaps or past edges. For this to occur, the cloud droplets must be of a similar size to the wavelength of light. Note that this is different to the refraction that causes rainbows – refraction is the bending of light when it passes from one substance into another, e.g. from the air into a raindrop. Diffraction also causes a beam of light to ‘spread out’. The amount that the light spreads out depends on the size of the gap and the ‘wavelength’ (colour) of the light. This process is depicted in the diagram below. Since different colours of light diffract by different amounts, this causes the colours to separate. 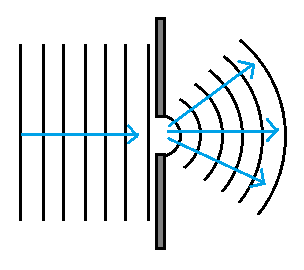 The image below shows the pattern you see if you diffract a beam of white light through a single slit on a piece of card. You can see here that there is a bright white line in the middle, followed by many paler coloured lines on either side. So how does diffraction cause cloud irisation? As light passes between the raindrops, diffraction causes the different colours of the spectrum to fan out, meaning we see many different colours. However, due to the irregular shape of the cloud, the colours are not neatly organised like the image above, and are often mingled together. 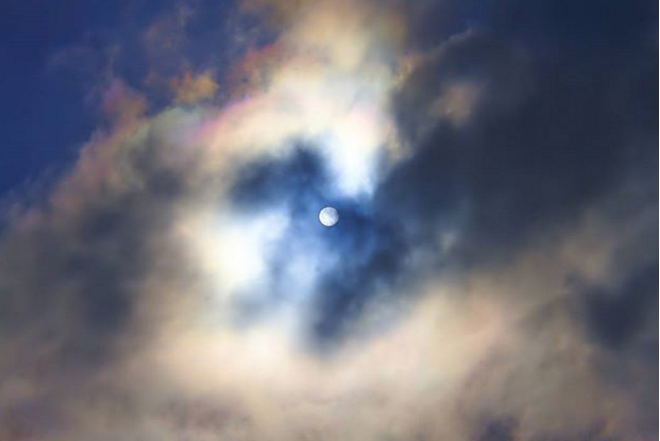 The photo below shows a good example of cloud irisation, with rainbow colours appearing above the sun in the picture. This was photographed over Christchurch by Glenn, @grf_my_perspective on Instagram, in November 2016. A corona is formed in a similar way to cloud irisation. They occur when thin clouds composed of water droplets cover the sun or moon (but are thin enough for the light to shine through). Light is diffracted by the small water droplets in the cloud. The difference here is that coronas usually occur when the cloud is more uniform in terms of thickness and the size of the water droplets. The more uniform the cloud is, the sharper the corona will appear. A corona usually appears as a circular rainbow coloured pattern around the sun or moon. These patterns will have blue on the inside of the circle, and red on the outside. Since the sun is so bright, when looking for a corona around the sun you may need to instead look at its reflection e.g. in a pool of water, or cover the sun with a small object (without obscuring the circular corona around it). Sometimes, a corona will have another, fainter rainbow-coloured ring around the outside, (or even more rings, each one progressively fainter). The image below shows a corona sent in by Sally (@littlemisscontented on Instagram). Since the sun is sinking below the horizon, and there is thicker cloud obscuring it from below, the corona only showed up as a partial circle in this case. A fogbow looks like a colourless rainbow, and forms in a similar way to a rainbow too. To see a fogbow, you must be standing with the sun at your back, and fog in front of you (though the fog must be thin enough to allow sunlight to pass through). The sunlight is reflected back towards you by the fog droplets at a particular angle due to refraction, creating the fogbow. But why no colours? Fog droplets are tiny – they can be 1000 times smaller than rain droplets. While the light is still reflected back towards you, due to the small size of the droplets, diffraction is now a more dominant process than in a rainbow. 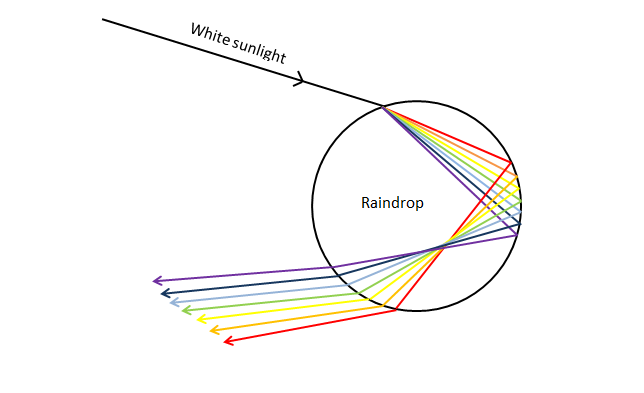 While diffraction bends light like refraction, and different colours of light are diffracted more than others, it also causes a beam of light to spread out or widen as it passes through small gaps (such as the gaps between the tiny fog droplets – see the diagrams above under ‘Cloud Irisation’). This causes the colours to mix together in the central part of the fogbow, creating white light. However, if you look hard, you may see a reddish tinge on the outer edge of a fogbow, and a blueish tinge on the inner edge. The photo below was taken by Amber Desmond Lockley, in Tokoroa in February 2016. On a day with wispy high clouds in the sky made of ice (cirrus clouds), have a good look around for an ice halo. ‘The 22° ice halo’ (see below) is just one phenomenon amongst a broad range of atmospheric optical phenomena that occur when sunlight is refracted and reflected through ice crystals, in clouds high up in the atmosphere. Some of these show rainbow colours, as ice crystals can act like prisms, separating the different colours of light. Ice crystals can come in many different shapes and sizes, depending what temperature it was when they formed. High up in the atmosphere, water can remain in its liquid phase well below 0⁰C (super-cooled liquid water), and the temperature at which it freezes has a great effect on the shape of the resulting ice crystal. Circumzenithal arcs (CZA) are caused by light being refracted through plate crystals (flat, hexagonal crystals). The light enters through the top, horizontal face of the crystal, and leaves through a vertical side face. CZA’s usually only form when the sun is less than 32.3⁰ high in the sky. The arc appears as an ‘upside down rainbow’, and will be seen above the sun from the point of view of the observer. The photo below shows a good example of a circumzenithal arc. It was taken by Robyn D Smith, of Ardees Photography. 22⁰ halos are created by refraction of light through randomly oriented hexagonal prism shaped ice crystals. 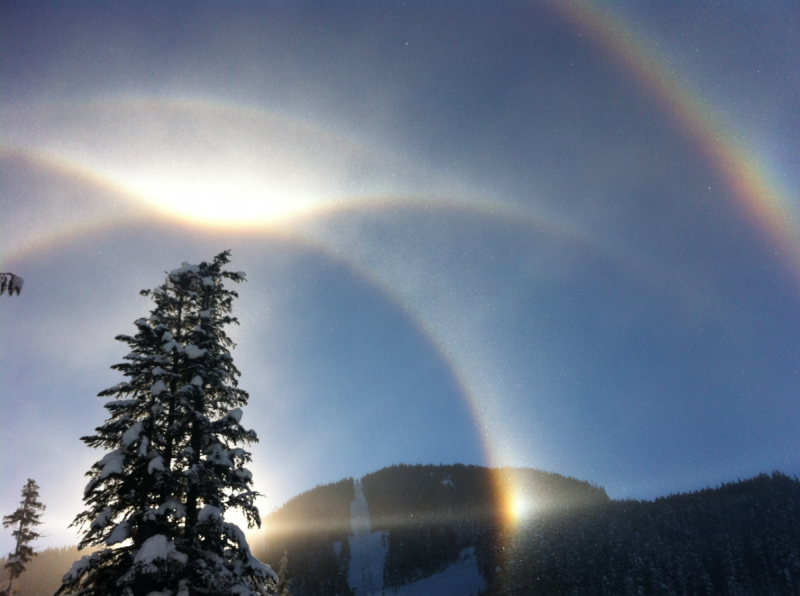 These ice halos occur very frequently, even more often than rainbows! Light is refracted as it enters through one face of the hexagonal ice crystal, and is refracted once more as it exits through another face. Due to the geometry of the ice crystal, rays of light are deflected through angles between 22⁰ and 50⁰ but more rays are deflected at angles of around 22⁰. This concentrates the light at this angle, creating a circle that is brighter than the sky around it. The photograph below was sent in by Michael Lane in Katikati, in August 2016. If you look carefully, you can see that the inner edge of the ice halo is red tinged, due to the fact that different colours of light refract at slightly different angles. 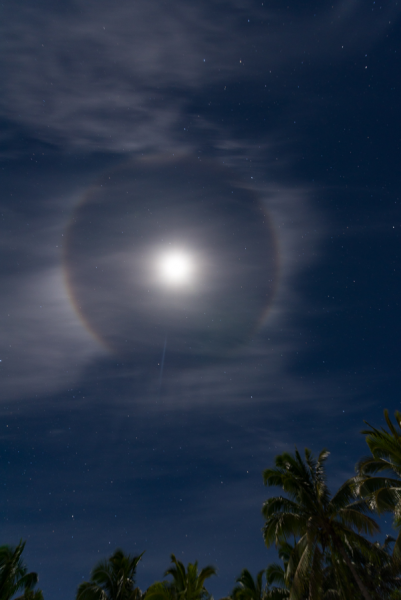 You can also get 22⁰ halos at night caused by moonlight, as shown in the photo below. This photo was captured by photographer Jonathan Usher. Sun dogs are also very common ice halos, and these are usually seen when the sun is low in the sky. They occur in pairs, directly to the left and right of the sun, though whether or not you can see both sun dogs in the pair depends on the extent of the icy cirrus cloud. If you are lucky, you may see a pair of sun dogs on the edge of a 22⁰ halo, level with the sun. 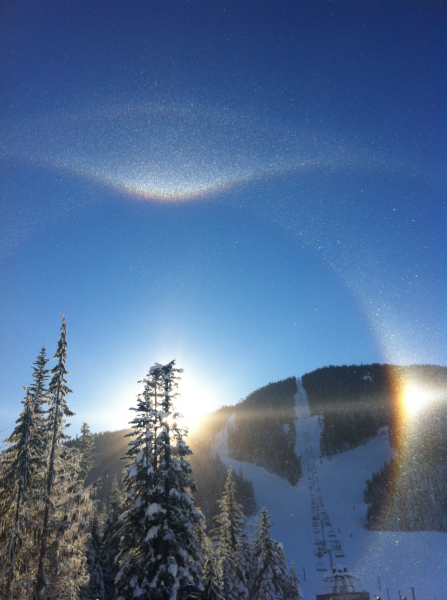 Sun dogs form in a similar way to a 22⁰ halo. However, they are formed by flat, hexagonal plate crystals. The plate crystals drift gently downwards in the air. This motion causes them to align themselves horizontally (more or less) due to air resistance. Because these crystals are aligned horizontally, they work to focus light either side of the sun. This creates two very bright spots to the left and right of the sun, with red light on the inside edge. The photo below is another one from Jonathan Usher. 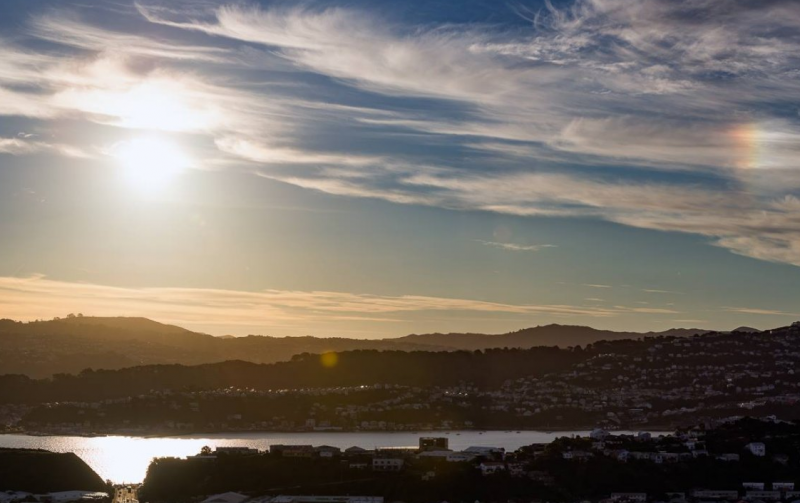 It shows a single sun dog to the right of the sun, and was taken in Wellington in August 2016. The ice halos described above are only a selection of the different ice halos that you might see while you are out and about. If you are lucky, you might see several of them together. An example of this is shown in the two photos below, taken by MetService Meteorologist Hannah Moes, while on a skiing trip in Canada. While all the other photos in this blog were taken in New Zealand, I thought I would include these ones anyway, since they show a great example of several ice halos together. 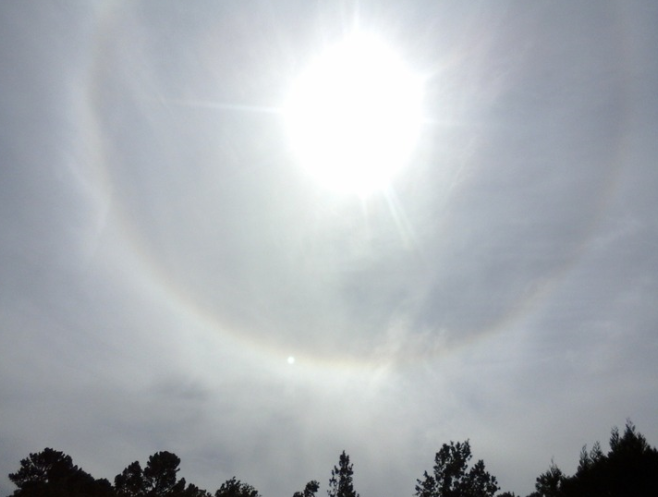 In the photos above, you can see a 22⁰ halo encircling the sun. To the right is a sun dog. You can also see an upper tangent arc, touching the top of the ice halo. Tangent arcs are formed by column shaped ice crystals, oriented horizontally. The rainbow coloured arc on the outside of the first photo is a supralateral arc (caused by similar ice crystals to the tangent arcs) and is one of the more uncommon ice halos to see. These two photos are a little bit different to the earlier photos in this blog, because the ice halos aren’t caused by high cirrus clouds! They are caused by ice crystals much closer to the ground. The photos were taken at Whistler Ski Field in January 2013 (Winter in Canada), and temperatures were well below zero. The extremely low temperatures caused ice crystals to form close to the ground – a phenomenon referred to as ‘diamond dust’. Like ice halos and arcs, light pillars are formed by ice crystals. However, the way they are formed is much less complex – light simply reflects off of ice crystals in the air. Some pillars are caused by sunlight, while they can also be created by moonlight, and even the light from Venus! City or other terrestrial lights can also be a light source to create pillars. The photo below was sent in by Leah Cameron in May 2016. 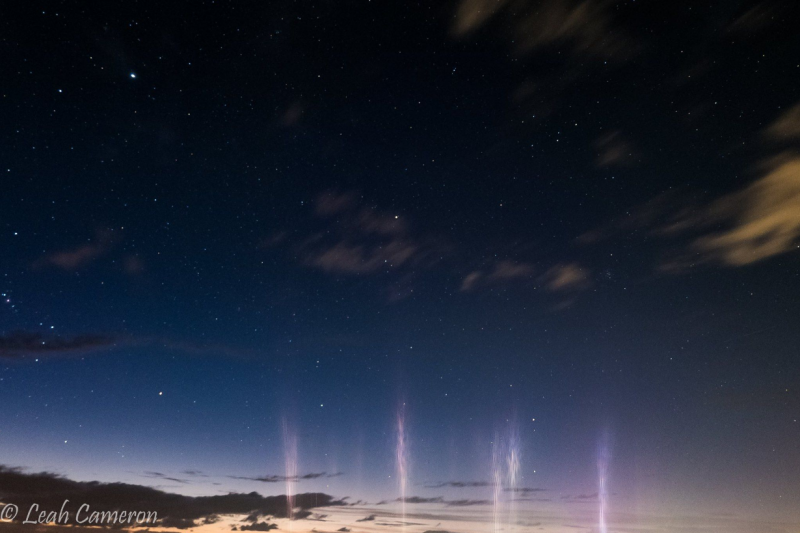 The light pillars in the photo are caused by artificial lights in Paraparaumu, reflecting off of ice crystals in the air and back towards the viewer. Sun pillars form in a similar way to the light pillars described above. However, they are technically part of the 'ice haloes' group, and are caused by the natural light from the sun itself. Sun pillars are most commonly seen near sunset or sunrise. 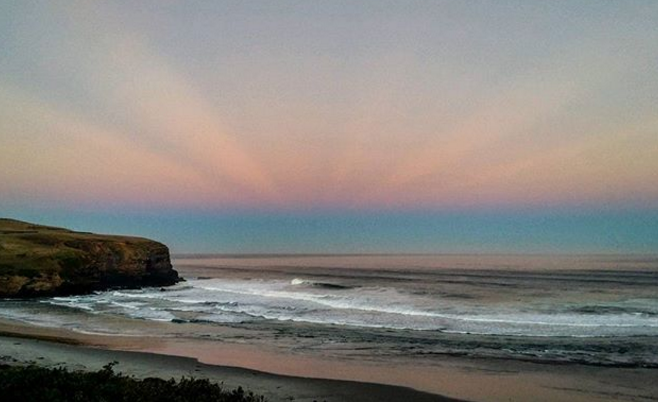 The photo below shows a faint example of a sun pillar, extending directly upwards over the setting sun in Otago. This photo was taken by Brad Phipps in July 2017. In the discussions above, there have been a lot of references to light being refracted, deflected, diffracted, or reflected (say that ten times fast!) Usually, the light has come from the sun, but sometimes from the moon, or city lights. Auroras are a different story. The lights of Aurora Australis (or Aurora Borealis in the Northern Hemisphere, or Northern Lights) are actually emitted by gas particles in the atmosphere itself. The sun emits a ‘solar wind’, which largely consists of protons and electrons. Protons have a positive charge, and electrons have a negative charge. During a solar storm, a larger amount of these charged particles are sent towards Earth. The Earth’s magnetic field interacts with these particles, sending them towards the poles. The charged particles transfer energy to the atoms and molecules in one of the highest parts of our atmosphere – the thermosphere. After the atoms and molecules have absorbed this extra energy, they then radiate it away once more. The energy is radiated away as visible light, and the colour of the light depends on the atom or molecule. Oxygen atoms are responsible for most of the green seen in aurora displays, and some of the red. Molecular nitrogen is responsible for the blues and purples, and also emits some reds. 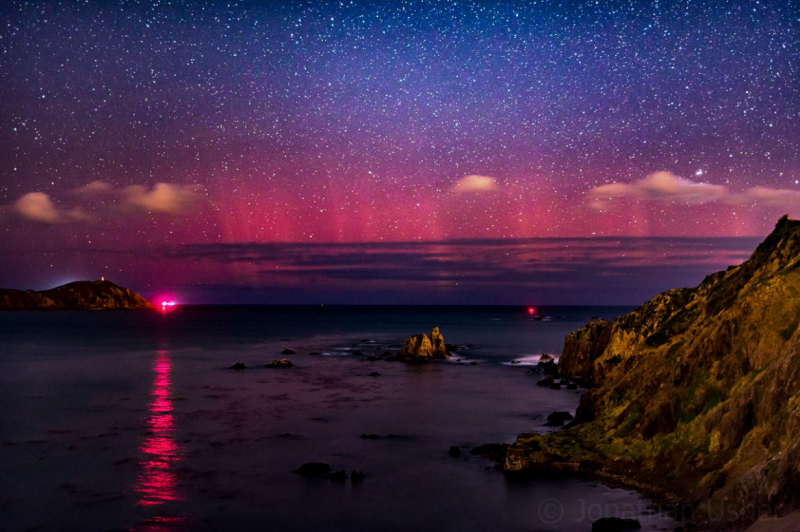 The photo below was taken at Point Dorset, Wellington in July 2016, by Jonathan Usher. There are many more atmospheric optical phenomena that you may see in New Zealand skies. If you happen to snap something interesting in the sky, feel free to send the photos in to us. You can upload them to our photo gallery, or send them to us via Facebook and Twitter. We would love to see your photos, and we may even have to add to this blog if you’ve seen something that hasn’t already been discussed here! Richard Hamblyn, (2008) The Cloud Book. Newton Abbot, UK: David and Charles Ltd.